Coal and coke were the most popular fuel for fires in the home during the 19th century. 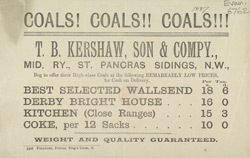 Householders could buy their coal through the post from a company such as Kershaw's, who would then deliver it to their home. Coal was kept in cellars below the house and then carries to the upstairs rooms like the kitchen or the sitting room. Coal was also the chief cause of fog and smog in Britain's industrial cities, as memorialised by Dickens in the opening pages of 'Bleak House': "Fog everywhere. Fog up the river, where it flows among green aits and meadows; fog down the river, where it rolls defiled among the tiers of shipping and the waterside pollutions of a great (and dirty) city. Fog on the Essex marshes, fog on the Kentish heights. Fog creeping into the cabooses of collier-brigs; fog lying out on the yards, and hovering in the rigging of great ships; fog drooping on the gunwales of barges and small boats. Fog in the eyes and throats of ancient Greenwich pensioners, wheezing by the firesides of their wards; fog in the stem and bowl of the afternoon pipe of the wrathful skipper, down in his close cabin; fog cruelly pinching the toes and fingers of his shivering little ’prentice boy on deck. Chance people on the bridges peeping over the parapets into a nether sky of fog, with fog all round them, as if they were up in a balloon, and hanging in the misty clouds."